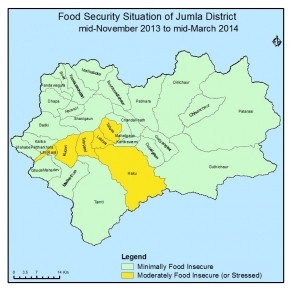 •The overall food security situation of Jumlais minimal food insecure. 24 VDCs (Cluster – A and B) out of the 30 VDCs. Remaining 6 VDCs (Cluster - C) are moderately food insecure. •Stock of Market and Road access the market, 1000- 1500 MT of estimated food stock in local markets. •NFC Food Stock and Distribution; 400 - 500 MT food stock in NFC godown 310 MT food NFC has been distributed to HHs as subsidies rice from 3 Depo. •Income by sale of agri-products; from organic apple NPR 1.8 million, NPR 18 Million income by sale of Bean, Potato and vegetables, like that income NPR 16 Million from by sale of Milk and sheep and goat. •Income by sale of NTFP; NPR 36 million from the sale of NTFP – (SatuJara, Yarchagumba, Ghuchi Chaue, Shughandhwal). •HHs has been received remittance NPR 30 million, from the different source i.e Bank and IME. •Market food Price; 5 -10% market price has been increased which is acceptable. •The overall food security situation of the district will remain generally food secure. •People will have the remaining food stock from the normal harvest of summer crops. •Market food stock will be sufficient as the Karnali Highway and other foot/mule trails will be functional in the winter season so, which will result to be normal market stock of the commodities as well. • Probably RCIW will be implemented in 5 VDCs of the district. •Out migrated HHs members will bring in some money. • Good opportunity of income through the sell of Apple Saplings. • Wage opportunities will be created by the I/NGOs & GOs. (black topping of the highway) and GOs budget is expected to relize from the district which will increase the wage opportunities from the implementation of Dev.activities.